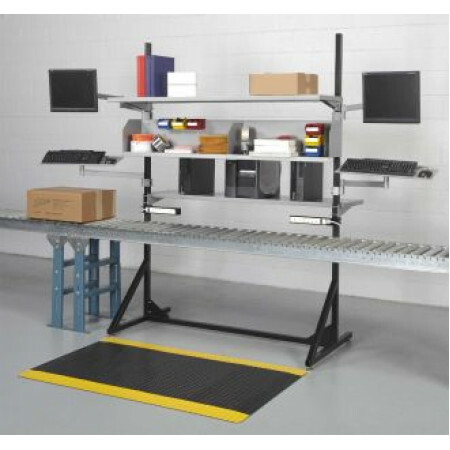 Complete packaging station with easy view monitor brackets. Strong reinforced "L" frame to hold all your necessary packing materials and packaging work table above your conveyor system. Duel monitor and key board brackets swing out of the way when not in use. • Top shelf holds manuals and spare parts boxes. • Carton shelf is 64"W x 17"D.
• Middle document shelf is 64" x 17"D and is facing backwards for more table top space.